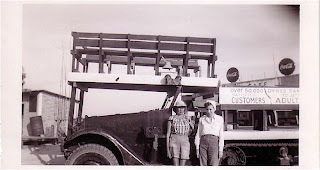 Thanks to Michael Leahy of San Antonio for finding a few old pictures from the late 1940's on Flicker. I downloaded three because they looked neat. The first one is entitled "Lee's Cafe" which was reported to be the only cafe on the Island back in 1946. In fact, the legend says it was the only building on South Padre Island! We do know there may have been some coastal patrol stuff but it sure does look stark. Apparently everything was washed away by the Great Hurricane of 1933. Below is a picture of the south jetty at Brazos Santiagos Pass. I still can't figure out if the wooden structures are railroad trestles or what. All that is left of the structure are some square concrete blocks used to support the wood. This is my favorite in the collection. How did you get to Padre Island in 1946? Well there were ferries at times, but the most fun was Mrs. Dyke's Taxi, shown here in Port Isabel. 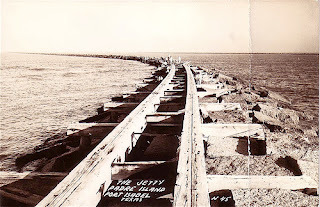 It looks amphibious - not sure if the old causeway was open but there were no roads on SPI back then. If you want to learn more such as about the Gulf Coast Causeway Company the National Park Service has a great website here. Apparently, the Causeway company formed in 1925 wanted to build a roadway from Port Isabel all the way to Corpus Christi, 110 miles away. The idea was based on the Florida Keys, which had a railroad and highway. A sports arena, gambling, and giant park were planned, along with cottage and motorcourt developments. If the Depression and Hurricane of 1933 hadn't happened, we might see more of what they accomplished.